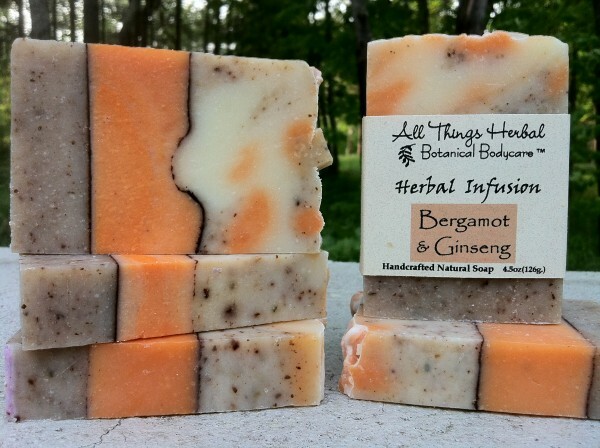 Each bar is infused with herbs & flowers, using 100% plant oils and other Earthly delights. 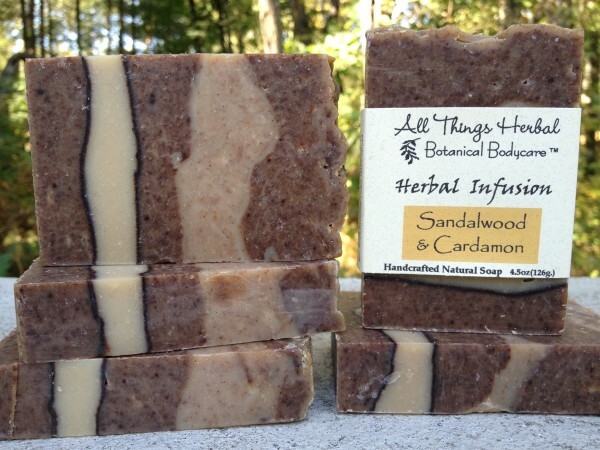 All natural, cold process soap you and your skin will love. Delicate hand-gathered organic Calendula petals, a wonderful skin-soothing herb that grows beautifully in Minnesota, are infused in Olive Oil for deep healing and moisturizing. A ray of sunshine for your bath with bright uplifting essential oils of lemongrass, lemon and litsea cubeba. Cold-process soap made with select moisturizing oils you and your skin will love - Herb-Infused Olive, Coconut, Palm Kernel, Sunflower, Cocoa Butter, Shea Butter. 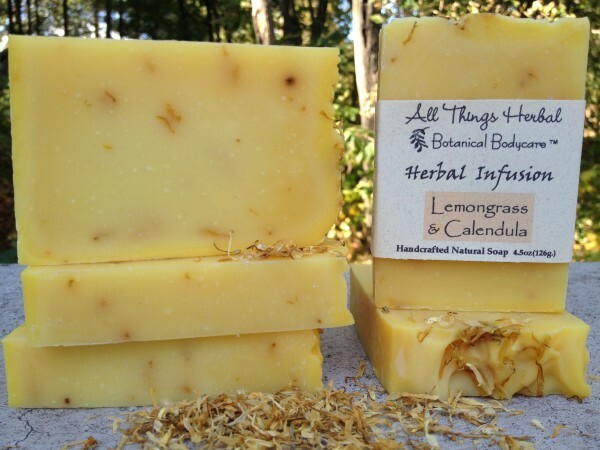 Special Additions: Calendula Petals, Lemongrass, Lemon and Litsea Cubeba Essential Oils. A luscious citrus-herbal infusion. Organic Ginseng Root is grounding and balancing while Italian Bergamot oil lifts the spirit and revitalizes. Swirls of gentle Kaolin Clay, mineral-rich Rhassoul Clay and Ginseng Root work together to nourish and protect your skin. Cold-process soap made with select moisturizing oils you and your skin will love - Herb-Infused Olive, Coconut, Palm Kernel, Sunflower, Cocoa Butter, Shea Butter. Special Additions: Rhassoul Clay, powdered Ginseng Root, Bergamot Oil. 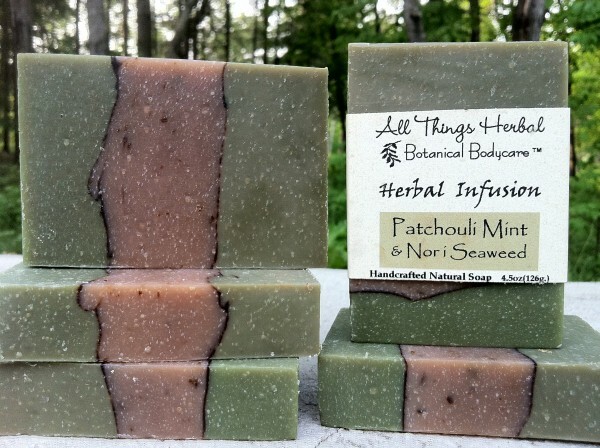 The rare combination of Patchouli and Mint have made this bar a customer favorite. Handcrafted with swirls of purifying French Green Clay teamed with detoxifying Organic Nori Seaweed, refreshing peppermint and the deep notes of patchouli, this bar will smooth, clarify and rejuvenate your skin. You'll love the warm, natural colors and the unexpected pairing of peppermint and dark Indonesian Patchouli essential oils. Patchouli is grounding and gives the wearer a sense of confidence while sprightly peppermint brightens moods and gifts the wearer with alertness and energy. Cold-process soap made with select moisturizing oils you and your skin will love - Herb-Infused Olive, Coconut, Palm Kernel, Sunflower, Cocoa Butter, Shea Butter. Special Additions: Nori Seaweed, French Green Clay, Patchouli, Peppermint and Spearmint Essential Oils. It's the perfect combination of soothing and revitalizing. Exotic and intoxicating Indonesian Sandalwood infused with sweet and spicy Cardamon. This scent lingers on your skin and is a warm and earthy scent that both men and women love. Enriched with nutrients that renew and refresh your skin. Shea Butter and healing Comfrey Root swirled with Sea Clay. Cold-process soap made with select moisturizing oils you and your skin will love - Herb-Infused Olive, Coconut, Palm Kernel, Sunflower, Cocoa Butter, Shea Butter. Special Additions: Sea Clay, powdered Comfrey Root, Sandalwood accented with essential oils of cardamon, cedarwood, patchouli, and amyris. The ying and yang of simple herbs ~ warm and uplifting cinnamon is energizing while henna is cooling & soothes and conditions the skin. 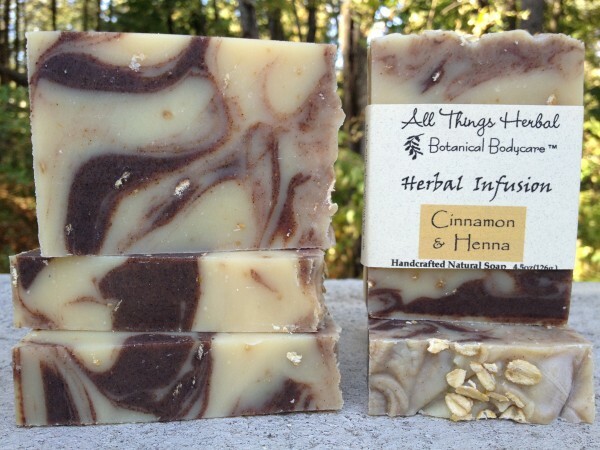 Natural oat grains and swirls of cinnamon and henna are wholesome goodness for your skin. Cold-process soap made with select moisturizing oils you and your skin will love - Herb-Infused Olive, Coconut, Palm Kernel, Sunflower, Cocoa Butter, Shea Butter. Special Additions: Oatmeal, powdered Henna and Cinnamon. It's the infusions... each batch is made using a very important step. We infuse our oils with precious herbs and botanicals, maximizing their benefits for your skin. We find that to know the individual ingredients and to take the time to use the earth's botanicals, indeed creates extraordinary soaps!